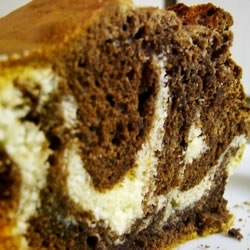 This homemade marble pound cake recipe produces a cake that is so moist and tender. It's chocolate and peanut butter; what's not to love? Offering easy cake recipes, homemade desserts and more. PREHEAT oven to 350 degrees. Grease the bottom of a 9x13 pan. Cover the bottom of the pan with wax or parchment paper, then grease and flour the pans. Tap to remove excess flour; set aside. In a small bowl, stir together the cocoa, confectioners' sugar, butter and 2 tablespoons hot water until smooth and set aside. In microwavable bowl, place peanut butter chips and shortening. Microwave on high for 1 minute, or until chips are melted and smooth when stirred. In large bowl, combine cake mix, brown sugar, 1-1/4 cups water, eggs and reserved melted peanut butter mixture; beat on low speed of electric mixer until moistened. Increase speed to medium, beat 2 minutes until smooth. Remove 1-1/2 cups of the batter and add it to the reserved cocoa mixture; blend well. Pour the peanut butter flavored batter into the prepared pan. Drop spoonfuls of the chocolate batter on top. Swirl with a knife or spatula for a marbled effect. Bake for 40 to 45 minutes or until a toothpick inserted in the center comes out clean. Cool and frost. Sprinkle with the chopped Reese's peanut butter cups. Peanut butter frosting recipe below. Place the butter and peanut butter into a medium bowl, and beat with an electric mixer. Gradually mix in the sugar, and when it starts to get thick, incorporate milk one tablespoon at a time until all of the sugar is mixed in and the frosting is thick and spreadable. Beat for at least 3 minutes for it to get good and fluffy. You may want to hide this marble pound cake recipe, because your friends and family will beg you for this recipe.